The oiran Aizome conversing with a peddler who is offering her festival items through the vertical slats at the front of her brothel. One item is an unadorned miniature rake and the other is a miniature rake with adorned with a mask of Okame. Lying on the floor in front of Aizome is a packet/envelope of the white face powder sold by Mr. Sakamoto. It was called Bien Senjokō and was named after a famous onnagata, Segawa Kikunojo III (1751-1810). One of his poetry names was Senjo (仙女). Sakamoto was a known patron of the production of ukiyo prints, especially those by Eisen, which he used to advertise his products. Aizome's red undergarment, now pink with age, is decorated with cherry blossoms and maple leaves overlying a overall hemp leaf pattern. "One of the most effectively advertised products was a white face powder (oshiroi) called Senjokō made by the Sakamoto family in the heart of Edo. Sakamoto's ancestors had been part of the ukiyo-e print world so he was particularly adept at the use of print in promotion. He was responsible for many examples of what we would now be called 'product placement'. The name Senjokō appeared innocently in prints as a sign on a wall or discarded wrapper, or more overtly with copy extolling its virtues in the background of a 'beauty' print." Quoted from: Japanese Popular Prints: From Votive Slips to Playing Cards by Rebecca Salter, pp. 73-74. 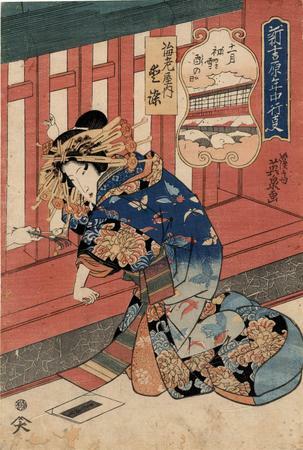 Illustrated in color in 原色浮世絵大百科事典 (Genshoku Ukiyoe Daihyakka Jiten), vol. 11, p. 76.